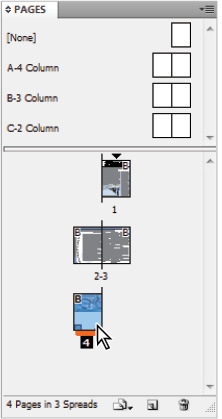 This tutorial provides you with a foundation for working with Adobe InDesign navigation. It is the first lesson in the Adobe InDesign CS6 Digital Classroombook. For more Adobe InDesign training options, visit AGI’s InDesign classes. The Pages panel provides a quick overview of the contents of each page in an InDesign document. You can use it to navigate between document pages, rearrange pages, and also add or remove pages. You can also use it to create transitions between pages that are distributed as electronic documents, and create page variations such as portrait and landscape variations for use on a tablet. 1 Press the Pages button ( ) in the dock at the right of the workspace to display the Pages panel. The bottom-left corner of the Pages panel indicates that there are four pages displayed in three spreads within this document. 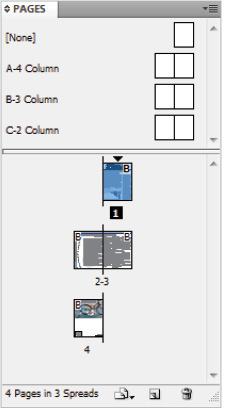 You can use the Pages panel to add and delete pages as well as navigate between pages within your InDesign documents. If you are unable to see all the pages displayed in the Pages panel, you can make the panel larger by clicking and dragging on the bottom-right corner of the panel. You can also scroll through the pages in the Pages panel by using the scroll bar along the right side of the panel or the scroll wheel on your mouse. Use the Pages panel to navigate to the different pages in your document. You may want to get a closer look at parts of your document to align objects, check the spacing of type, or position of items in your layout. InDesign makes it easy to change the magnification so you can zoom-in on parts of your document, or zoom out to get a birds-eye view of your layout. 1 In the Pages panel, double-click on the page 1 icon to display the first page of the document. 2 Select the Zoom tool ( ). Using the Zoom tool, click and hold in the upper-left corner of the Spinnews logo at the top of the page, and then drag down to the lower-right corner of the logo. Release the mouse once you have reached the lower-right corner of the logo. The area you have selected with the Zoom tool is magnified. You may find that you enlarged the document either too much or not enough. To fine-tune the magnification, click with the Zoom tool to increase the magnification incrementally. Or, if you zoomed in too close, decrease the magnification by pressing and holding the Alt (Windows) or Option (Mac OS) key while clicking with the Zoom tool. 3 Select the Hand tool ( ) from the Tools panel, and then click and hold down on the page in the document window. The page magnification changes and a red frame appears, indicating which portion of the document will be visible when you finish scrolling. 5 Press and hold the page in the document window. Position the red frame so the entire border of the image is visible, and then release the mouse. The zoom returns to its original level, focused on the part of the page you identified using the Hand tool.